Join me for 2 weeks (plus 4 days of prep) of delicious whole foods designed to naturally detox your body. I provide over 60 delicious recipes – there is no deprivation during this program! Join me and a group of motivated fun people while we all do this together! Ditching the toxins that cause excess weight and dropping the pounds without dieting. There is a solution and it does not involve dieting, pills, powders or any of that mayhem. The best part? It will only take 14 days, plus 4 days of prep. Your body is probably carrying around roughly 5-10 pounds of toxicity (a.k.a inflammation)? This means that the headaches, bloated belly, cellulite, and digestive upset can be a result of all the toxicity we encounter daily. All too often, we eat “healthy” foods that are actually wreaking havoc on our systems and creating more toxins. A 14-day whole foods detox designed to cleanse and pamper your body from the inside out. Maybe you have. But this detox is different. And though your body is designed to naturally detox itself—it cannot possibly cleanse itself of the horrendous number of toxins that are present in our modern world! It needs your support, and if it doesn’t get your support—it will become congested, stagnant and overloaded. Maybe you’ve already reached that point. That’s why you need a detox. A detox helps release your body from the toxins it is subjected to during your day-to-day interactions with metals, chemicals found in cleaning products, food, drinks, and more. That’s why, during this program, we’re ditching the fasting, pills, and extreme measures the diet industry pushes on us and focusing instead on what really matters—improving your digestion and eating whole, seasonal foods that are designed to support your body’s natural processes of detoxification and cleansing. Just a real plan to tackle your health and bring your body back into balance. And yes, it is also delicious! Hi! My name’s Marcie Desmond and I’m a certified health coach. I’ll be here to support you during this restorative, 14-day Reset. Here’s the thing…this program will guide you, step by step, through eliminating the foods that are potentially butting in on your health and happiness. This step-by-step approach to detoxing is designed to help you finally figure out which foods fuel you—and which ones don’t—safely and quickly, WITHOUT feeling like you’re missing out on your favorite foods. What’s included in this Detox? Spring Detox Guide:A step-by-step manual that’s chock-full of everything you need to know to detox in a safe and natural way. Private Group Support – You’ll have complete access to my expert support and unique outlook within the private group. You can ask me anything you want! I’m here to support you every step of the way on your journey. You’ll be surrounded by an empowered group of people all doing this together! 14-Day Guide with Suggested Meals: This will help you stay on track and take the guesswork out of meals during your detox. You can also make up your own meals from the food list and wide variety of recipes. 14-Days At a Glance: A day-by-day protocol for your entire detox, with easy-to-follow recipes that make this journey easy to follow. Shopping Lists: If you want to follow the suggested meals, then I can make trips to the supermarket super simple, which makes preparing and cooking for your detox a breeze. Food Diary: This tool will help you keep track of how you’re feeling physically, mentally and emotionally throughout the program. Additional Handouts: Educational tips and approaches to a healthier lifestyle. This program is not a diet, so there’s no one telling you exactly what to eat, no calorie counting, and no hunger. Instead, this program is all about being in tune with and listening to your body. 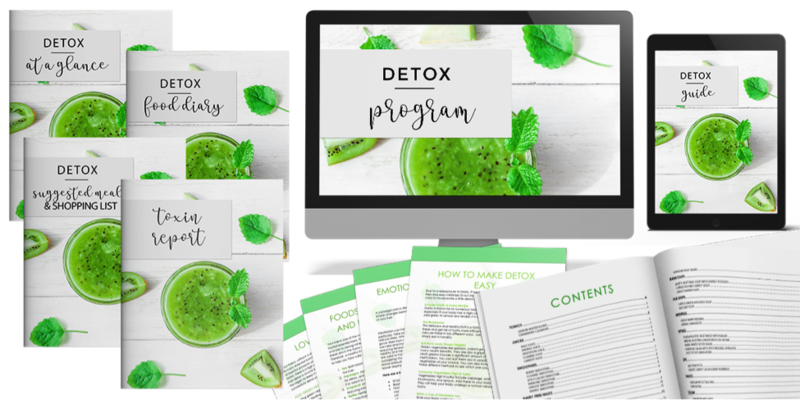 Second, this detox is based on the elimination diet, so you’re working with a proven, three-prong approach used by functional medicine doctors and nutrition experts around the globe. Third, there are no pills, powders, or pre-made shakes as part of this program. That means you don’t have to buy any fancy supplements to make it work. You can find everything you need at your local grocery or health food store (or on Amazon!). You may lose 4-7 pounds. You may feel lighter, experience an inner glow that others notice immediately, and have tons of natural energy (minus the crash that accompanies your daily cup of coffee). You can actually lose those sugar cravings …it’s not that hard! You can improve your sleep patterns, e.g. no tossing and turning all night long! You can lose that belly bloat – and feel comfortable in your jeans again! You should feel much better in your own skin, enjoying more confidence, before the summer madness starts! And that’s just some of the benefits my clients have experienced! Have you tried diets and programs that did not give you the results you were hoping for? Do you crave unhealthy foods that are sabotaging your weight loss efforts? Are you looking for more energy and fewer trips to the coffee pot or the vending machine at 3 pm? Get the results you crave from one simple program. Join the Spring Detox – Reset with Marcie! Not at all! There are over 60 recipes for breakfast, lunch and dinner, and there is room for snacks in between. There is also a list of detox-friendly foods you can choose from to create your own meals. Every meal is delicious and designed to nourish your body from the inside out. This program is not about starvation or deprivation, and we are not counting calories or dwelling on carbs. You will feel satisfied with every bite. If you do get hungry, there are extra snack recipes included or plenty of foods to choose from! You will have the option to choose between various plant or animal-based proteins, which will be listed out for you in the Detox Guide and include in some of the recipes and suggested meals. There are so many clean-eating protein sources to choose from, you won’t get bored with your options! 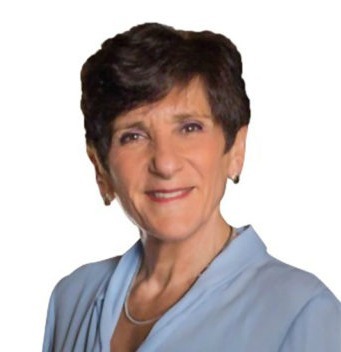 For over 25 years, Marcie’s career in executive management and consulting included C-level positions in Information Technology for private companies, as well as State Government. After losing 60 pounds and turning her own health around in her mid to late fifties, she realized she needed to ditch her corporate career and follow her true passion – helping others lose weight, get healthy, conquer food intolerances and sensitivities and get the support they need to manage and beat Type 2 Diabetes. As a Certified Integrative Nutrition Health Coach, Marcie offers clients long-term, sustainable and fully supported help finding their own way to good nutrition, great health and amazing whole-body-mind wellbeing.